port on the Atlantic coast of the New World. 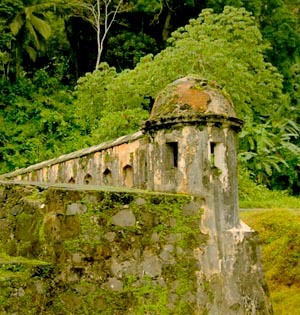 The fortifications in Portobello were built to defend the treasure fleets from the attack of pirates. 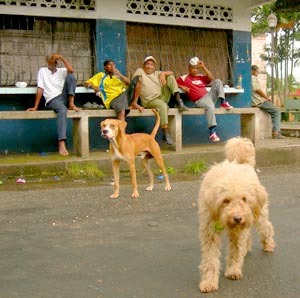 It often rains on the Caribbean side of Panama during June and July. 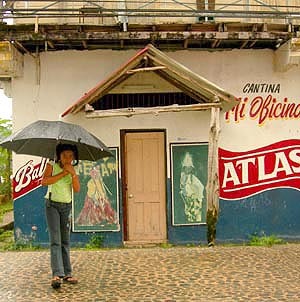 Atlas is the name of a top Panamanian beer. These dogs are both owned and are two of many who run loose. Make sure to check out the body postures of these unposed men. Though families may not act towards their pets like people in the US, sometimes they're more part of the everyday going ons of a family. 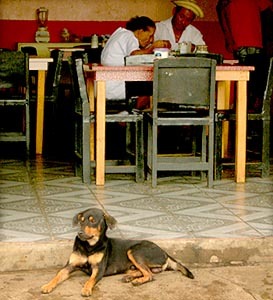 Dogs know that to go into a restaurant is strictly forbidden. When Bruiser made his way to the kitchen, he got a glassful of water thrown in his direction. He didn't go back. This is one of the few times I was initially nervous of letting Dog and Bruiser mix with local dogs, as unbeknownst to us, we were on these three owned dogs territory and when they saw us, they charged at my two. Fortunately, Dog and Bruiser speak the same language and after a few minutes of sniffing and mutual respect, all was well. Other travelers I've met are reluctant to let their dogs mix with locals, but I feel the only real danger would be catching a skin disease. And after 1 1/2 years of mixing, they show no signs. This journey is much about my interactions, as theirs. 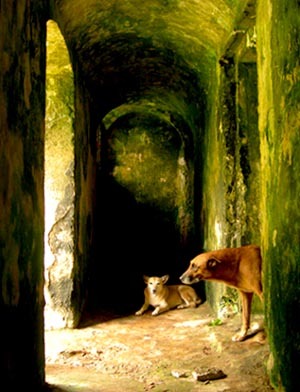 Inside a series of partially underground rooms at the Santiago Battery, Portobello, Panama. On the outskirts of Colon, Panama where I stayed with a friend, the dogs and myself went for a morning walk inside abandoned US military buildings. A freighter coming through the Panama Canal, being pulled by several 'helper's on tracks. I saw a chained dog at a gas station which had a mass of loose wire wrapped amongst the rope and chain, threatening to injure the dog in the eyes. I didn't think anyone cared, so I embarked on disentangling the mess. The young man in the picture appeared, clearly upset I was interfering. When I explained what I was doing, he helped and it was clear any danger to the dog just hadn't occurred to him. Dianne grooms Gillie while Dom watches. 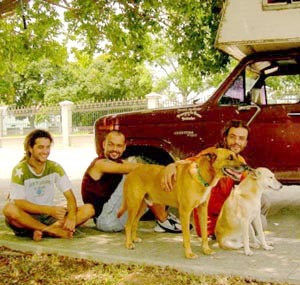 This Canadian couple shipped their van, while flying themselves from Panama to Colombia. The two Argentinian men on each side are on their way back home and are deciding whether to sell their truck and camper in Panama, or ship it over the gap. 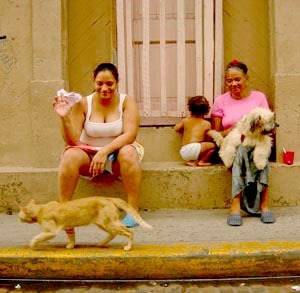 This scene unfolded in the old quarter of Panama City. The old quarter of Panama City. This couple had pulled over in the parking lot, turned up their stereo and began to dance. Panama City. 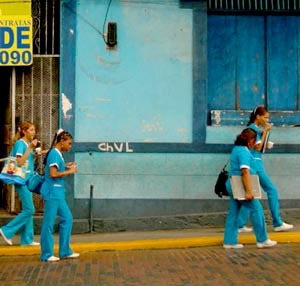 Schoolgirls in the old quarter of Panama City. 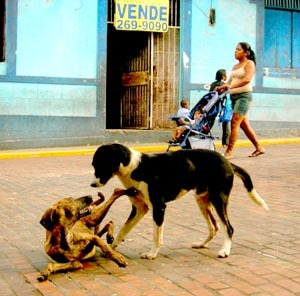 Despite this being a busy one-way street, these two young dogs dodged the cars and played happily in the old quarter of Panama City. 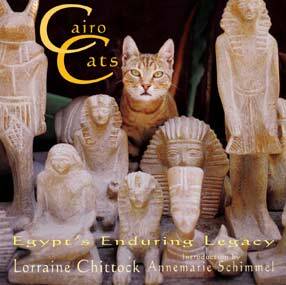 Because of a unique arrangement with the co-publisher of Cairo Cats, I'm able to sell copies via my own website. I'm just beginning to realize the uniqueness of what I'm doing. Yes, there are others traveling through South America. Yes, there are a few traveling with their dogs. There are women traveling alone. Others are also keeping a blog. There may be people traveling while earning a living, though I haven't met any. But all of these combined? And in an ex-surveillance van almost thirty years old? 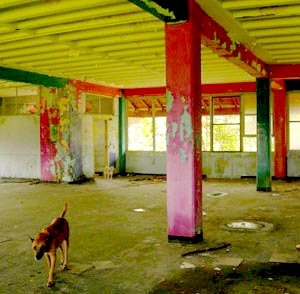 Mine is a 21st century South American version of John Steinbeck's odyssey, Travels with Charlie. I'm writing this from the apartment of a new American friend who works in Bogota, Colombia. Morning sun is pouring through floor to ceiling living room windows and I'm able to really get some serious work done after two months being on the road. Within in a few blocks there's parks where I can walk the dogs and a mountain beyond. I couldn't be happier. I'd heard plenty of reports the country was not as dangerous as it once was, yet I still associated Colombia solely with the cocaine and coffee trade and imagined endless fields throughout a country twice the size of France. 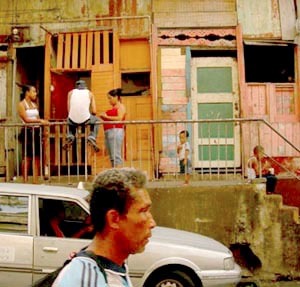 I've been surprised by cosmopolitan and trendy Colombian cities. You can never judge a place until you visit, and not fully even then. *Three nights alone with my dogs on a tiny island. *Dog bumbed by a motorcycle while walking across street. No injuries. *Dog bumbed by a car while straying from sidewalk. No injuries. *Forced to pay a polce bribe for the first time. *Involved in an accident with a motorcycle. *Visit to Rio Claro, one of the ten most beautiful places on earth. *Stay in historical Cartagena, where the local park has sloths, giant iguana's, monkeys and other wildlife living outside cages amongst city dwellers. This is Part One. The second and third page will be up a bit later. To see photos available for purchase to help contribute to this continually evolving lifestyle, see www.LorraineChittock.com and www.WorldWideBeasts.com. I always appreciate your emails. If it takes me longer to respond than normal, my apologies, but I'm desperately trying to get caught up with my work writing for magazines. But I wll get back to you! 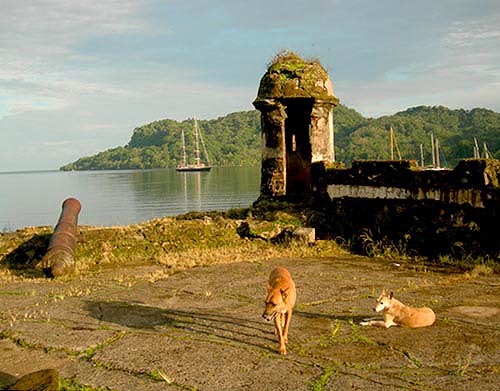 In 1999 while living in Kenya I got the idea I wanted to write in beautiful places accompanied by my dog. 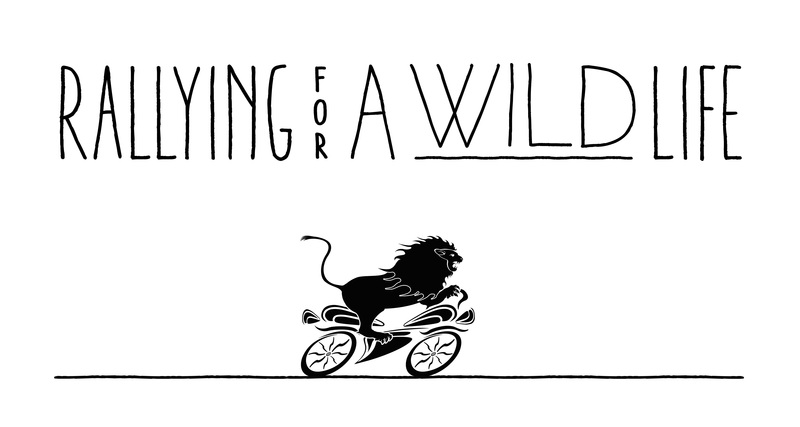 The first trip to Tanzania was an unproductive but eventful ten day trek in a 1983 Land Rover. I also had the idea of living in one wonderful locations for six months while doing freelance work, and then moving on to explore new areas of the world for six months. Alas, the man I married didn't take to the idea and for various reasons we parted. Nevertheless, I felt the ideas were good and could work - IF some of the kinks were ironed out. Late in 2003 I began writing from a Jeep Wrangler while traveling in America's SouthWest with my two Kenyan born dogs. It was a productive time while camping. I also accepted the house invites of friends scattered throughout the states. I loved this way of seeing friends, as our lives were joined for priveledged moments as opposed to rushed visits. 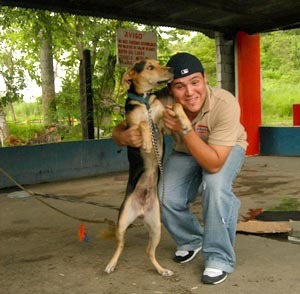 In late 2005 I journeyed for three months through Central America to Costa Rica in a Chevy van which used to be a police surveillance vehicle. Again, it was a very productive way to work. My schedule was to wake at 6 am, walk the dogs, and be writing by 7. If it was a travel day, I wouldn't be on the road tll 12 and would start looking for a new campsite at 3pm. I'd walk the dogs again, make a campfire, prepare dinner and do a bit more work in the evening. This schedule would be broken up with chats with new friends I met on the road, or with taking in tourist sites, buying groceries, doing laundry and the other routines which make up most peoples lives. I was pretty happy. 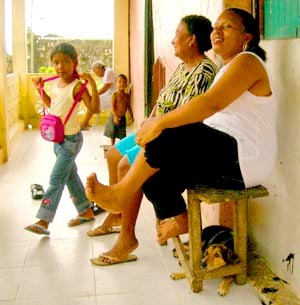 I found a place to live in a Costa Rican fishing village, but after 13 months took off for South America and envioned that my work-while-traveling schedule would resume. I was mistaken. The last two months have been difficult traveling and it's been a continual struggle to balance my work needs with the needs of my two dogs and the needs of myself. The biggest challenge has simply been that camping in both Central America and Colombia thus far is difficult. Or rather, camping as I mean it. 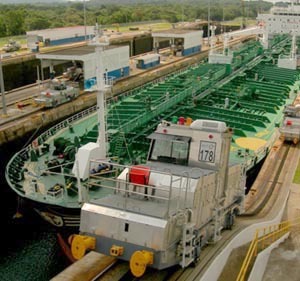 I spent about four weeks in Panama City camping in a huge car park which is a meeting point of other travelers who are transporting their vehicles by freighter over the Darien Gap, an impenetrable stretch of jungle dividing Panama and Colombia. I realize there's a huge amount of people in the US who camp at WalMart and other parking areas, but I've only done so once in an emergency. However, as parking lots go, this was pretty ideal. It was on the Pacific entrance of the Panama Canal in view of the Bridge of the America's, and I was able to get wifi and water from the Balboa Yaught Club, as well as some social interaction from some of their regulars and sailors who all seemed to be sailing round the world. Some had been en route for five years. It was also a great place to walk the dogs except there was an endless supply of scraps on the ground left by picknikers and partiers. 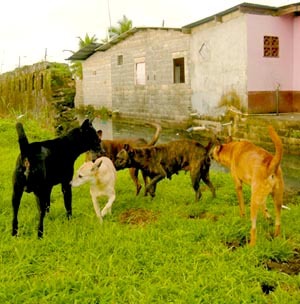 Bruiser reverted to being a scrounging street dog and even with decreasing his regular meals, he still gained weight. Meeting other travelers was encouraging as I was petrified to head south. I had few fears about Colombia since all the reports from others who'd ventured there within the past four years had been extremely positive. I did feel however that I was jumping off the deep end. Once I paid the $1500 to get the van across, there was no turning back. This part of the journey symbolized the beginning of the end. There was no way that after traveling through South America, I would then ship a van I bought for $750 back to North America or elsewhere. Instead, after thousands of miles of driving, depending on the van's condition I'd either ditch it, or see if I could re-coop my money. The engine was strong and it was possible I might even make a profit. And then what??? Either Africa, Europe or back to the states. I had no idea what the future would hold. But the journey wouldn't continue in what I now consider my 'home'. There was another reason for my fears. Traditional nomads revisit the same grounds year after year despite their roaming lifestyle. 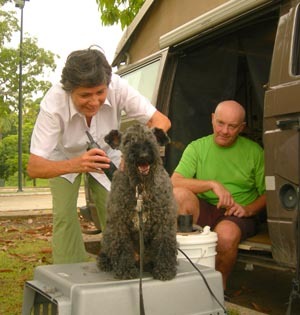 Retired RVers in the states and Europe do the same. There's a reason for this. We need familiarity and consistency. During the two years and 30,000 miles I traveled in America I too revisited the same places again and again, and stayed with the Doughty family in Houston many times as I passed through Texas from east to west, and west to east again and again. These repeated revisitations with places and friends were solidifying and gave my voyage a sense off continuity. Heading to South America felt like dropping into the unknown. This was a continent where I had no contacts, and no friends. Everything was new, new, new. But was this true? I'd visited Santiago, Chile for five days last year. I now know two lovely couples traveling ahead of me. There's two Argentinian men behind me. There will be others I have yet to meet who I might visit with again. And a few old friends from the states who might fly down in the future. I have my van, which is my movable house and my two dogs who've been my faithful and enduring companions almost 24 hours a day for the past four years. And I have a daily working and living routine which surprises people in it's rigidity, but gives me a sense of solidity. Free spirit I am not. We all need stability in one way or another. Once I took the plunge and committed to putting the van on a freighter, a huge weight was lifted and I sensed I'd be fine. And so far, I am. Fear can be consuming. It's up to us to question what is true, and what isn't. Please check out my two new set of photos at either www.LorraineChittock.com or www.WorldWideBeasts.com. If you would like your photographs signed, please email me and we can set up a personal arrangement.